and back yard! Thanks Plow & Hearth for the great products! 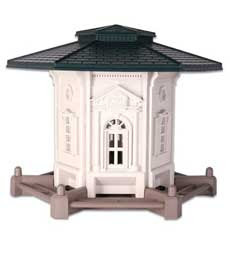 Le Grand Gazebo Feeder is a beautifully crafted, large volume feeder for serious birders. It features an easy fill removable top, clear view panels on all sides and a weather-resistant cedar construction. With its 20 lb. capacity you won’t have to refill it every day, so you’ll have more time to enjoy your favorite songbirds. Mount on pole or post. 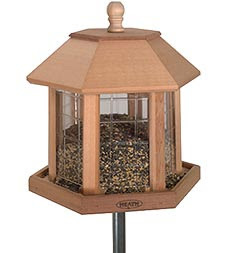 Le Grand Gazebo Feeder Combo includes the Gazebo Feeder and three helpful accessories: a squirrel baffle to deter those furry little seed robbers; an adjustable pole with ground socket for secure mounting; and a handy scoop/funnel for easy filling. A great all-inclusive gift for your favorite birder! Feeder 16" dia. x 19"H; 10 lbs. Brilliant finches, charming chickadees, colorful cardinals…your yard will be bustling with many little songbirds thanks to this feeder. Easy to fill feeder holds 5 lbs. of seed and features two sizes of perches to attract even more birds. Colonial styling adds interest to your yard or garden. to give away one Colonial Bird Feeder! My girls would love this!!! I have been thinking for awhile about getting one for the backyard - and this one is beautiful!!! What an awesome giveaway, I would love to win this! Love the video and pictures! You are great Shauna! I would LOVE to win this. One of our sons got a minor in Ornithology, the study of birds. He keeps a bird manual on kitchen counter so we can look up the different species. I also would love to vote for you again. You are such a sweetheart! * Seriously thanks for this opportunity! Opps...I have your Sisterhood button! And your book button;-) This is a lot of entries! Ha! You are too sweet! And how can I forget the cute button for this blog! Yep, I follow! We love bird watching in our back yard. I keep my hubby busy during the Summer filling up the feeders. This one is really nice! My sons would love this. They are very into birds and this would be wonderful in the backyard. We would love to win! My kids and I love feeding the birds, what a great spring addition to our yar this would be. I have your button as well, happy spring Shauna! I am also a fan of Plow and Hearth on Facebook! I feed the birds summer and winter. In the summer they bring their babies to the feeder. I would love to have another one as I don't know how much longer this one will last. These are very nice, sturdy looking ones. Oh ya I follow here and love this blog! Oh my gosh, I would LOVE this! I'd love one of these. Our family are bird fanatics, we love looking out the window and observing wildlife. I love this. Maybe I can get Dennis or Randy to make me one. Oh, how I would love this bird feeder! I'm not allowed pets where I rent at present, and I must rely on birds dropping in for my critter fix! Plus this feeder is absolutely gorgeous! Please, I'll take good care of it! Following book giveaways blog as Wanda. Following Sisterhood blog as Wanda. Following Trying 2StayCalm blog as Wanda. P&H FB fan as Wanda Ham. Did u see the new pillows & outdoor cushions they're showing? When I am stuck in bed, I can have my husband put this outside my winder and it will seem like I am out there enjoying nature right with them! THank you for the chance to win this...it is SO beautiful! Facebook Fan of Plow and Hearth. Am so glad you showed us this company! The bird house is great, I am in need of a new one, seems the squirrels decided to make a new entrance in the top of my old one. I would love to win this giveaway and give it to my mother in law who loves birds! I'ma also a follower of your blog trough Googel Friend Connect. Hi! The bird feeder would make an awesome gift for my parents. Fingers crossed! What a beautiful Bird Feeder. My Boys would love to have this in the backyard to enjoy the birds. I have your book button on my blog@! I'd love to hang this feeder in my yard! My kiddos are fascinated by the birds that come to visit. With a sweet feeder like this, we could get them to stay a bit longer. 3 8 voted for you. How cute! I never thought about getting a bird feeder, but I think it's a wonderful idea! I follow you sisterhood blog! I'm a FB fan of Eden Home!